Purpose – are you living yours? “If you can’t figure out your purpose, figure out your passion, for your passion will lead you directly to your purpose.” T. D. Jakes. It’s a great quote. But actually, how scary would it be to follow the advice? You maybe choosing your options – GCSE or A Level, maybe even thinking about what to do at Uni? Or you’re finishing your Uni course and now you have to get a real job? You could have even done all this, have a job and you STILL don’t know what to do. I pretty much had no clue what to do with my life until last year. I’m 32. I have vague memories of my passions from the ages of about 8 and again at 10. But these memories are there because they’re quite painful. I remember trying my best at something I loved, only for it all to go wrong. Embarrassing. Door closed. I learned it was too painful and embarrassing to do what I loved, so I stopped doing it. It’s taken me A LOT of digging, searching, regressing, being brutally honest, hiding, testing, trying and generally going on a massive emotional journey to get just a bit of my passion back. Such a big part of me has fought this, on every level. My negative nagging voice has told me to give up endless times. But I’m determined to find my purpose in this world. I know I’ll never be truely happy until I do. Trust me; I’ve had a decent job, decent car, nice house…..nice “stuff” and part of me still craved more. Part of me, dispite having all the material abundance I could have wished for, was still unhappy, or rather “unfullfilled”. Im certainly not unhappy with my life – I have an amazing partner, a beautiful healthy daughter, loving friends and family, even a better than average dog and much, much more – I love so much of my life. It is my career and what I do day in day out which gives me this sense of unfulfillment. As an intuitive sensitive empath (or highly sensitive person) I always felt alone, lost, confused, unable to make decisions on my own and fully insecure about my path in life. I don’t want more of you guys, to do this. Waste your time. Spend endless years in miserable jobs, endless time searching and wishing things were different. And making bad decisions which will not and do not make you happy. Well, firstly we all have a purpose. Wether you believe in God or not – the universe has a purpose for you in this lifetime. When you live it, realise it and honour it, you will find happiness. I’m just starting to realising this. Nothing makes me happier than helping people, inspiring and creating. It’s a joy that is like no other. Pure joy and happiness. I also believe your passions are evoked and developed in childhood. Then, most of us, have some kind of experinece or influences from peers/parents role models etc. which put us off our passion. I.e. comments like “you can’t make a living being an artist”, “It’s not a real job” or thoughts like “That hobby I have (i. e. Baking, decorating cakes, designing dresses, writing, making music, drawing, creating), is nice and I’m good at it, but you’re not the best” or “it’s a tough industry to break”, “you need to stop dreaming get a real job”…. blah blah. And our passion gets forgotten, swept away and dismissed. As it did for me. Maybe you’ve had a similar experience? See, I loved creating things for other people to have fun with or use. I remember making a treasure hunt style game with some “The little mermaid” stickers (man, I so wanted to be a mermaid!) for a brownie camp I was going on. I spent days putting them together and creating. I was in my flow. I was doing something I loved. I wanted people to enjoy and have fun using my resource. I was so excited. Sadly, I’d not thought it out fully enough (I was about 8) and it didn’t work out. EVERYONE knew it had gone wrong. It was so embarrassing and painful. Blergh! I learned never to do it again. And I didn’t. I stopped creating things for people to enjoy at the age of 8 or 9. I loved art and design, and chose these as options at school, but never felt “good enough” to follow them through into a career. I’m naturally a perfectionist and because I wasnt the best in my class, I didn’t feel I could follow these subjects through to university because they’re would be tons more talented people than me and it was too painful and embarrassing to “not be the best” and it wasn’t worth my time and effort. Realising this about myself has been a huge weight off my shoulders. It’s made me realise that I don’t have to he the best at everything I do, and slowly I’m learning to trust myself, my soul, again and rekindle my connection to what I love. But how sad…. I missed out on a whole 3-5 years of undergraduate study, possible careers and expeeineces which would have directly linked to my passions and possibly my purpose. -You cant possibly turn your back on a career or job now… it’s too late! I’m living proof. At 32, I’m quitting my job as a successful teacher after 7 years. Who knows what the future holds, but all I know is that life is too short to let FEAR determine my happiness and fulfilment. And it was so surprising to find out that fear of not having “stuff” in the future was one of the main worries that teens felt when I conducted some research. Worries about not getting a good job, not being able to buy a house, a car, clothes. There we have it. FEAR. Fear of following our dreams. Fear of not being a success. Fear of not having enough stuff. Fear of what people will think. Fear of not living up to expectations. So what did I do? What can YOU do? Re-read that quote. Then follow it. 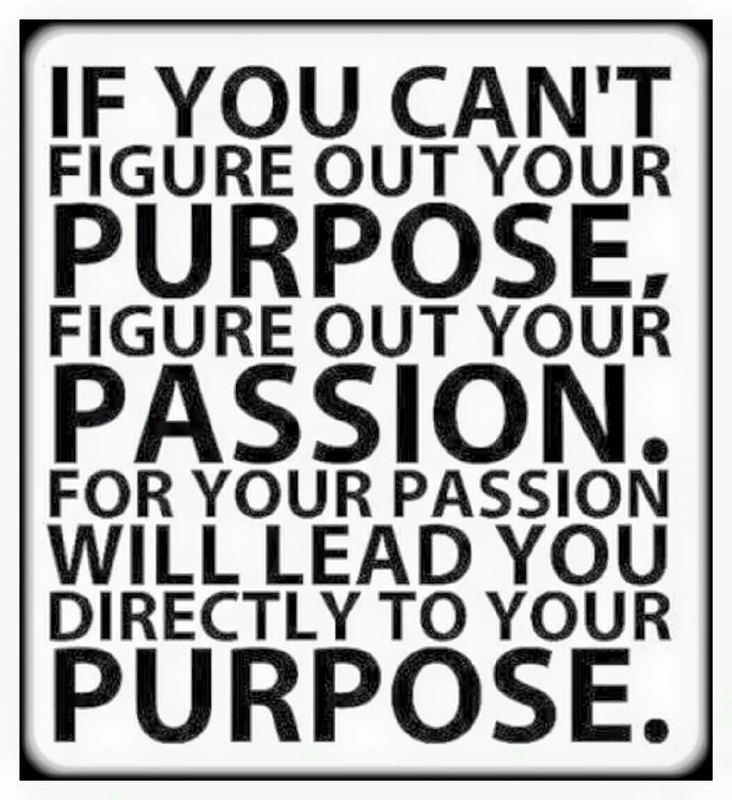 If you can’t figure out your purpose, figure out your passion, for your passion will lead you directly to your purpose. I took the time to remember what my passions were: helping people, giving advice, yoga, eating well (nutrition), adventure, the outdoors, creating (specifically for me drawing and painting), and surprisingly; writing. I took the time to build these into my busy life, daily and weekly. I took the time to journal and rediscover what was already inside of me. I made a massive effort not to let other peoples ideals, standards and perceptions affect MY choices. I made a pact with fear – that I would recognise it as just that; a feeling of fear, then I chose to walk right on by it, right through it. I made sure I took time to reflect and learn from every one of life misdemeanours, mishaps and set backs. I made no solid plans and have no preconceptions of how this will turn out. I made a decision to trust. I surround myself with positive and uplifting people. I read, I absorb and try my best to walk my talk. I give thanks, I appreciate what I have, I practice my skills and talents. Most of all, I value my inner voice and I live in the moment.